Vehicular movement around Suhrawardy Udyan in the capital will be restricted on Saturday ahead of a mass reception to be accorded by Awami League to Prime Minister Sheikh Hasina there. The roads from Shahbagh intersection to Matsya Bhaban and TSC to Doyel Chattar will remain off-limits from 1 pm till end of the reception programme, Dhaka Metropolitan Police (DMP) said in a statement. 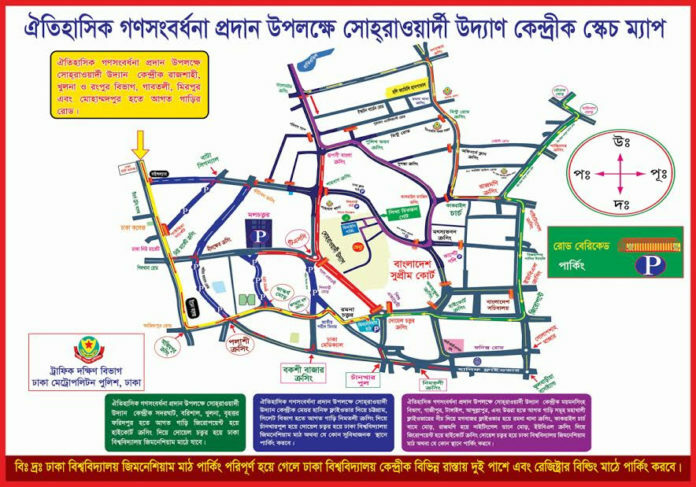 Vehicles going towards the Suhrawardy Udyan and Dhaka University (DU) campus may be diverted through Banglamotor, Kakrail Church, UBL, Zero Point, Golap Shah’s shrine in Gulistan, Chan Khar Pool intersection, Bakshi Bazar, Palashi intersection, Nilkhet, and Katabon crossing, it added. Leaders and activists coming from Mirpur have been directed to park their vehicles in Nilkhet area. Besides, the vehicles coming from Mohakhali are advised to drive through Moghbazar-Kakrail Church-Nightingale-UBL-Zero Point-High Court to Doyel Chattar and park their vehicles at DU Gymnasium. Vehicles coming through Farmgate-Sonargaon intersection-Shahbagh intersection have been directed to turn right from TSC and park at Mall Chattar, the statement read. Also, those coming from Jatrabari, Wari and Bongshal areas are advised to drive through Zero Point-High Court to Doel Chattar and park the vehicles at DU Gymnasium, while vehicles coming from Lalbagh and Kamrangirchar areas would have to park at Palashi-Nilkhet area. The reception will be arranged for attaining the eligibility to graduate to a developing nation, launching Bangabandhu Satellite-I, Sheikh Hasina’s achievement of Global Women’s Leadership Award from US-based NGO Global Summit of Women and her receiving D. Litt from Kazi Nazrul University of India. The reception programme will begin at 3 pm on Saturday. It is expected that a huge number of people from all walks of life, including leaders and activists of the party, and dignitaries will attend the programme.